The PSP 2 is rumored to have a control scheme that could be completely new to handheld systems. Though Sony's unannounced future version of the PlayStation Portable handheld is still a top secret project, it may already be on showcase to industry publishers. Most of us probably expected for Sony to follow in the Nintendo DS''s footsteps by including a touch screen control system into the next generation of the PSP, and this is rumored to be the case, but with a method that could vary from what has been seen before. Sources at Eurogamer say that the next iteration of the PSP will have touch controls not on the front of the device, but on the back. The outlet affirms that "three separate development sources" have mentioned the reverse touch screen, though the PSP 2 is believed to still be an unfinished product. The PSP 2 is reportedly being shown to publishers behind closed doors with one source alleging it could be released by the end of 2011, and others saying it won't happen until 2012 or later. 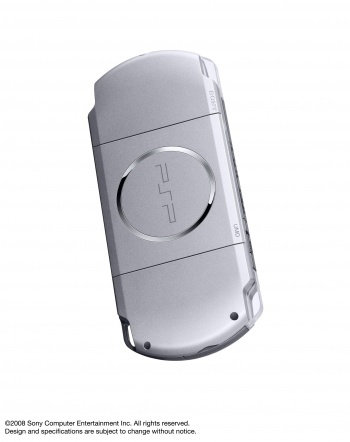 It's also rumored to be the same size as the PSP-3000, and may use Flash memory for storage media. Keep in mind that this is all pure speculation for now, because if sources are saying it's not going to be out for a couple of years, Sony could still be working on the final specs. The most intriguing rumor here is the reverse touch pad. It sounds strange, but theoretically it could allow for a form of touch control while still being able to use the PSP's face and shoulder buttons. The Nintendo DS's touch screen works great (for most games), but it does require losing the ability to use the handheld's face buttons. I'm not sure how comfortable it would be to feel around on the back of the PSP with the middle, ring, and pinky fingers while using the others to push buttons and control the D-pad/analog sticks, but it's definitely a new concept that sounds interesting.